Plan ahead this holiday season and schedule to have your Thanksgiving aboard a yacht this year with 5-star catered cuisine. This non-traditional alternative is the best way to avoid holiday traffic while experiencing New York in a new and unique way. Experience the New York skyline from the sky deck lounge while dining indoors at a table next to the window. Absorb the breathtaking views and enjoy the vibrant entertainment of your choosing. Our fabulous Thanksgiving Cruise offers traditional dishes like Roasted Turkey, Hickory Smoked Ham, Garlic Mashed Potatoes, Green Bean Casserole, and more! Do you have a homemade favorite you’d like to share this Thanksgiving? 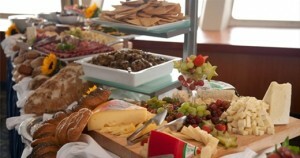 We provide additional top-notch customizable catering services. Whether your family is small or large, we can accommodate any size party. Contact our offices at 203-637-0270 or fill out our contact form HERE. Nautical Holiday’s premier quality and service make the difference. If you want to take in all the sights of New York, you’ll want to do it by boat. The comfort and speed allow you to enjoy the busy city with amenities and space you can find nowhere else. There are hundreds of sights to see from the water, but these are a few of our favorites. Located on Liberty Island, the Statue of Liberty is a sight like no other. Take in the views of this neoclassical marvel and New York icon. There are nine bridges in New York you can see, but the Brooklyn Bridge takes the cake. It is one of the oldest bridges in the United States that towers at 277 feet tall. 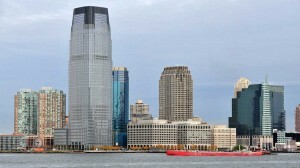 Take in unobstructed views of beautiful Jersey City from the water. There are few places in Manhattan where you can catch a glimpse of New Jersey like this. Formerly known as the One World Trade Center, the building stands as a tribute to all of those affected by 9/11. It towers tall at 94 stories high and 1,792 feet tall to the tip. Seeing beats 360-degree panoramic views of the entire New York skyline. There’s no better way to see New York than in its entirety. Nautical Holidays is here to answer any questions or inquiries you may have about reserving your next yacht charter. Contact our offices at 203-637-0270. If you are looking for a yacht that is great for hosting large events, the Majestic Princess is perfect for you. This vessel is a winning combination of affordability, comfort, and speed. 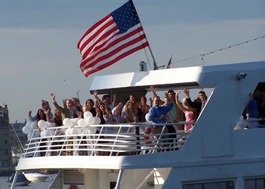 The ship can easily accommodate up to 300 passengers making it a great fit for large events. Whether it be a birthday, engagement party, or for lunch cruises. Guests will surely appreciate the roomy decks and panoramic windows that provide outstanding views of the New York City skyline. Enjoy top-notch cuisine prepared right on board. Hosts can choose from cocktail receptions, grand buffets or formal tableside dining. For leisure or business, the Majestic Princess is sure to provide an enjoyable time with fine cuisine. Enjoy all the luxuries of a yacht charter aboard this ship, here you can dine, relax, and take in the beauty of New York City. This yacht cruiser is 110 feet long featuring a cocktail lounge on the Bridge Deck and a large dining room on the Main Deck. 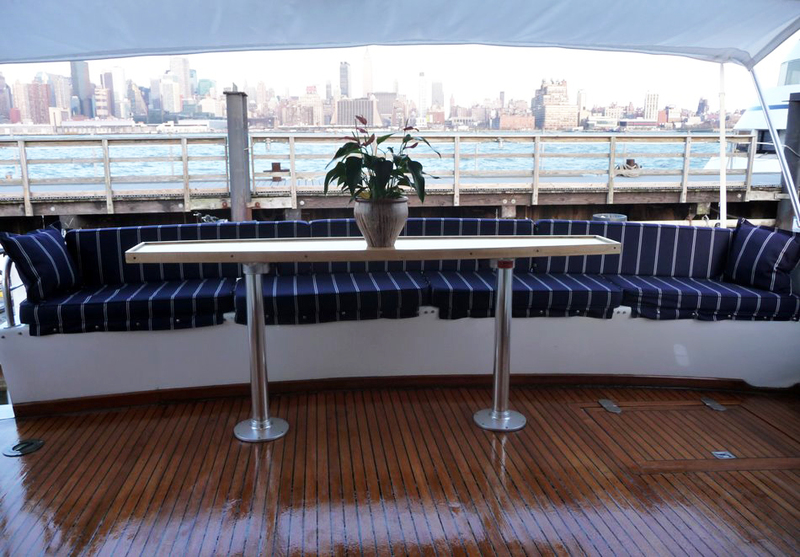 Enjoy all the luxuries of a yacht charter aboard this ship, here you can relax and take in the beauty of New York City. Request this ship for your next event for a premiere New York charter experience. Call our offices at 203-637-0270 for a quote and ask us about our additional event planning services! 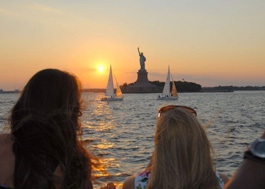 Invite your friends and family to enjoy the best seats in Manhattan this 4th of July on a luxurious yacht charter. Sail out to the waters and enjoy a memorable 4th of July experience unlike no other. Aboard you can have a great view of the fireworks alongside the New York City skyline. 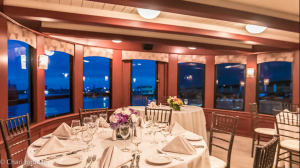 Customize your experience, enjoy an upscale dinner cruise, throw a large party, or enjoy a private event with loved ones. We offer a wide array of services including dining, DJ services, photography, and event planning. Our fleets can accommodate any party size big or small. We provide top-notch catering and can create everything necessary for the perfect 4th of July event. Take in the dazzling fireworks display while also dining a lavish five-course dinner. 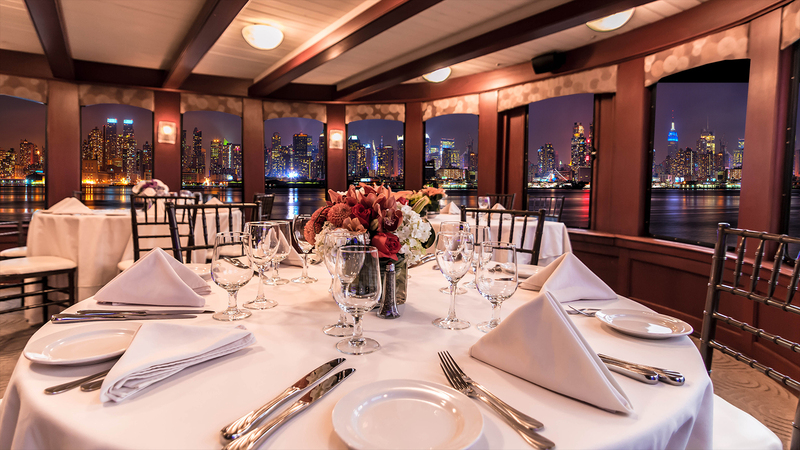 There is nothing quite like luxurious dining on the water. Celebrate an unforgettable Independence Day aboard your own private charter vessel. Contact us at 203-637-0270 for our fleet availability and details on customizing your perfect 4th of July experience. Summer is the perfect time to plan a party, especially out on the water. 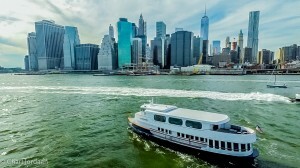 Plan a private yacht charter for you and your guests in beautiful New York City. We have 3 premium dining options: Brunch, Dinner, or Moonlight. No matter what how many guests, 5 or 500, we can accommodate any party size. For brunch or dinner you can choose between an open booking brunch or creating your own catered menu. We can provide a large variety of specials including any of your favorites. You can always decide whether you would like to dine inside or outside on the fantail or flybridge. 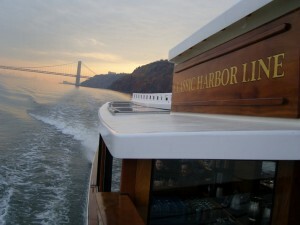 Moonlight cruises are similar to the brunch or dinner cruises but include an extra enticing scenic element. Sail a night under the stars, enjoy the skyline, and breath in the wonderful salt air aboard your own private charter. New York provides some of the most beautiful sight seeing in the world. If it is for business or pleasure, sailing is a unique way to enjoy the city without the traffic. Whether it is a lunch or dinner cruise, spend it in the lap of luxury on the Justine. The ship has been recently renovated and includes 5 staterooms that also make it available for overnight or longer voyages as well. This 97-foot luxury cruiser is the perfect yacht for small groups. The Justine can accommodate parties from 2 to 12 people. This upscale ship is spacious and well equipped with an observation deck, a main deck salon, and an outdoor deck with lounge seating. On the deck you can enjoy 360-degree skyline views while soaking up the sun. There is also a formal dining room, full service bar, and a fully equipped galley. The indoor lounge features state-of-the-art satellite HDTVs and an incredible sound system with MP3 and microphone inputs. Be the chef or have your meals catered to you, our kitchen has everything necessary to create any range of cuisine including waffles. The Justine is a beautiful yacht that combines both luxury and privacy. Chart a course this summer and create an unforgettable experience with your friends or family aboard the Justine. Enjoy serene sunsets on the Hudson and all of New York’s incredible sights while feeling at comfortable and at home. If you’d like more information about this yacht click here. Contact us with any questions or inquiries to begin customizing your event. Plan Your Next Charter Event With Us! There is no better way to celebrate a special event than on a yacht charter. 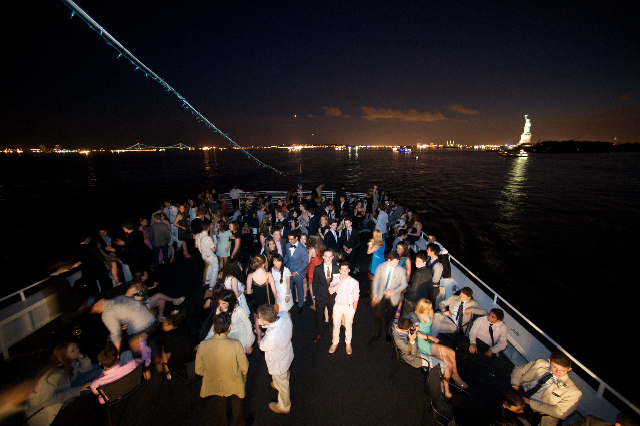 A New York Charter Yacht is the perfect experience for unique events like weddings, holiday parties, bar/bat mitzvahs, and more. Not only do you get the luxury of a yacht but the beauty of the New York skyline. Planning an event can be an overwhelming process, let us do the work for you! We also specialize in event planning. Let us handle the details like florists, DJs, and other requests you may have. We are prepared to handle any party size from 2 to 600 guests. Weddings can be especially stressful, our professional staff has first-hand wedding planning experience and are extremely detail-oriented. Let us help you prepare a beautiful and seamless experience, we offer full or partial wedding packages. We will organize everything for you from the photographer to the cake. We don’t only plan large events, but smaller ones as well, like a special anniversary voyage for you and the one you love most. Our services include limo arrival services and a luxurious red carpet entrance when boarding. 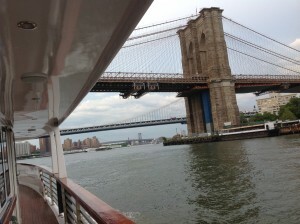 Full catering and drinks can be provided on board as you and your guests enjoy true NY sightseeing. Our planning process includes a personal inspection, which assures comfort and safety for you and your guests aboard your charter vessel. Before you start planning your next charter event, consider letting us do the work for you. We strive to make every aspect of your experience relaxing. Contact us here or call 203-637-0270 to get more info on how we can help you! Chartering a yacht is an experience like no other; especially on your own private yacht for you and your guests to venture across New York City. New York is one of the most popular destinations in the US. Avoid the crowds and traffic by enjoying the open water. 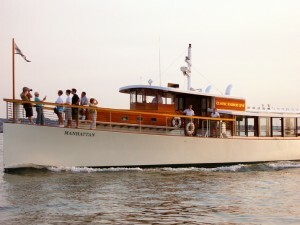 Chartering across New York gives you the capability to tour NY’s surrounding islands. 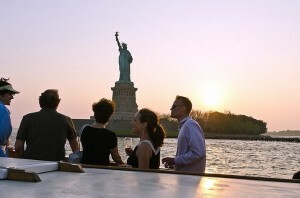 Dock your yacht and explore Ellis Island, Roosevelt Island, or Governors Island. Chartering a yacht is one of the most personally tailored and independent experiences you can have in New York. We have many different ships for various party sizes; the individual options are limitless. We can provide anything from music to catering depending on your parties needs. If you are looking for premium luxury, look no further chartering your own yacht is it. We dedicate our time and efforts into creating a truly unique and unforgettable experience. Start planning a trip today! Our charter brokers can provide you with guidance every step of the way. Questions or inquires? Contact us! We would be happy to answer any questions you have. 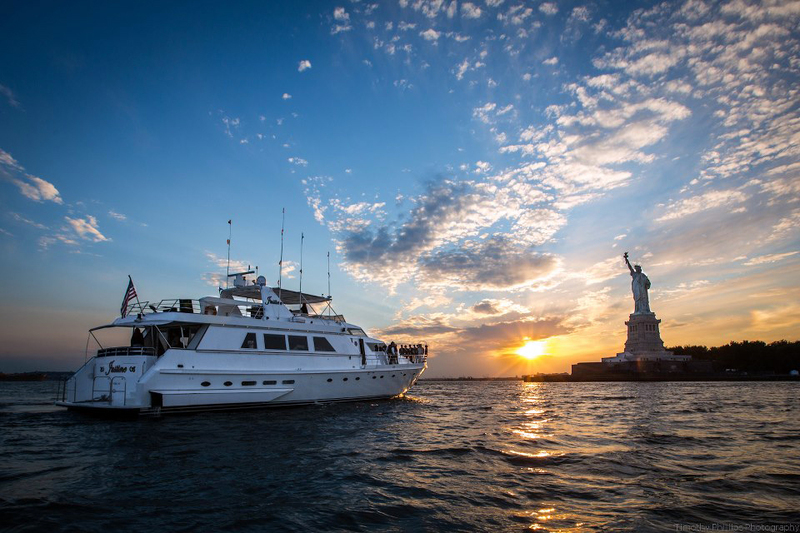 Host Your Own New York Yacht Charter! Sail across the Hudson and East River! New York is one of the most beautiful and busiest vacations you may ever take; so try something memorable like setting a course on your own private yacht charter. You can avoid the hustle and bustle of every day New York and experience the city in a completely unique way! If you are searching for an unforgettable experience look no further. New York is an ever evolving city with vibrant neighborhoods and culture. Sailing across New York is the best way to see sights like the Statue of Liberty, the New York City skyline, and all of the infamous bridges of New York. Experience true luxury and set a course down the Hudson and EastRiver on a private yacht. Day or night the beautiful New York skyline has a view unlike no other. This view is especially breathtaking at sea from the comfort of your own private ship. Schedule your own New York yacht charter and select a ship perfect for you and your parties needs. Any food, drinks, music, etc. can be provided on your ship to give you a serene experience or an exciting adventure. Nautical Holiday strives to work with you to accommodate the perfect voyage. This year try celebrating your New Years Eve on the open water. At Nautical Holiday we offer the chance for you to experience chartering your own extravagant yacht across the Hudson for the holidays. Look no further if you are trying to find a New Year’s Eve party that takes a step back from the hustle and bustle. Experience luxury on a premier yacht by hosting your own private New Year’s party. Many of our ships have open sky decks perfect for viewing fireworks. Set your own course and embark on a yacht making its way along the East River for an unparalleled sightseeing tour. There is no better way to ring in the New Year with sights such as the Statue of Liberty, the Chrysler Building, and all of the New York bridges. 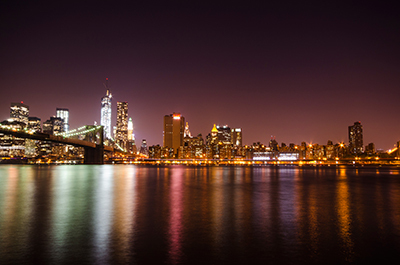 New York’s skyline is a remarkable view that looks even more miraculous at night. Whether it is a large party or a small gathering we have the perfect yacht to accommodate you and your group. We can provide you with any amenity such as gourmet catering, a live DJ performance, and a full service bar located on ship. What better way to start the New Year then on a luxurious yacht gazing at New York’s beautiful skyline view as a backdrop? Contact us with any questions you may have at 203-637-0270. We’re happy to answer any inquiries you have about chartering and our available yachts. ©2018 Nautical Holidays- New York Yacht Charters. All rights reserved.